This is an unconventional little book of interest to Michael Moorcock fans, but few others. Despite its title, most of the stories in this collection are not about Elric; they're about Sojan Shieldbearer, Moorcock's first fantasy character from the 1950s. The book also includes two non-fiction essays regarding the creation of Elric and Jerry Cornelius, two of Moorcock's most well-known characters, and concludes with a short sword & sorcery parody. "Elric at the End of Time," the novella from which the collection gets it name, does not neatly fit into the timeline established in the core Elric books. According to Moorcock's Introduction, this tale was written contemporaneously with the other Elric stories and was created before Stormbringer, although the tale itself bears little resemblance to other Elric stories and Elric himself is quite different. "Elric at the End of Time" sees Elric sucked into the End of Time, populated by the League of Temporal Adventurers, including Una Persson, Sergeant Alvarez, Werther de Goethe, Mistress Christina the Everlasting Concubine, and Lord Jagged of Canaria. The time-travelers are able to change their bizarre world at will, and do so repeatedly in misguided attempts to entertain Elric. The result is confusing for both Elric and the reader. "The Last Enchantment" is also difficult to place in Elric's timeline. In it, Elric is transported to the Palace of Kaneloon, where the Lords of Chaos are meeting in conference. Elric is challenged to "create something which it has never occurred to [the Lords of Chaos] to create." "The Secret Life of Elric of Melniboni" is a non-fiction essay on the creation of Elric written in the 1960s. 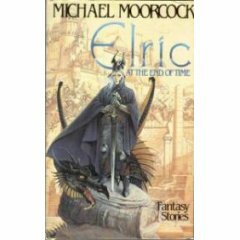 In this fascinating essay, Moorcock discusses how he came to create Elric, how Elric's personality and challenges were allegories of Moorcock's own, and how Moorcock feels about the critics' and public's reception of Elric. Moorcock pens a similar essay on Jerry Cornelius. It's a great opportunity to see what Moorcock was trying to achieve. Following this essay is the entire collection of Sojan Shieldbearer short stories. Sojan is a swashbuckling, sword-and-planet hero. Although human, he lives on the twin-sunned planet of Zylor, which was settled by humans fleeing (what they thought was) the dying Earth generations before. Sojan's people have lost much of their technology, but have retained dirigibles, air guns, and steel. They divide themselves among civilized and barbarian nations, dodge air pirates, and untangle political intrigue. Still, their culture is dependent upon the sword and the steed (in this case, the reptilian myat). The Sojan stories show much of the promise of action and creativity of Moorcock's later works, but here his execution has yet to be perfected. Fight sequences and plot lines suffer from logical leaps, an excess of convenience or "luck," and abrupt endings. Some of the tales read more like sketches; characterization is thin; dialogue is infested with clichis. Still, as "portraits of the artist as a young man," the Sojan stories remain of interest. The distinctions between Moorcock's initial forays into fantasy and his masterpieces are lessons for aspiring fantasy writers. The collection concludes with "The Stone Thing," a hilarious and memorable self-parody. Because of the book's very limited appeal, I give it a rating of 5 out of 10.